REO UK Ltd, the manufacturer of power quality and power management equipment has introduced a new range of high current transformers. The new units are based on the current transformer principle with single or multiple secondary turns. The range produces an output voltage of either 1.67 or 0.8V with output current ranging from 500 to 5000 A. They are suitable for use in test generators for power frequency magnetic fields immunity tests as specified in EN 61000-4-8:1993. 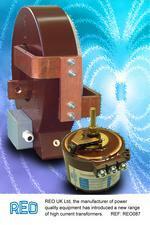 REO also manufactures the variable transformers that are used as voltage regulators. The high current transformers are compact, with a fully encapsulated construction and are easily installed with a simple screw fixing. They offer greatly reduced magnetic stray fields and have enclosed primary terminals in accordance with VBG 4. Testing for EMC compliance requires no additional devices. The units are manufactured in accordance with EN60742 (VDE 0551). Higher currents use a parallel connection and there are optional multiple secondary turns. Customs designs are also available.